I’ve been watching the Sony Hack with a lot of interest, for a variety of reasons. Mostly because of my interest in the security and enterprises environments. Yesterday however, we all witnessed perhaps one of the biggest disruptions to an industry that has gone largely undisrupted for many years. For the first time, I think, we saw the release of a new movie release, by a prominent movie producer – Sony – take their work and forgo the release in traditional movie theaters, instead opting for an online release. In my eyes, this has the potential to be the most accidental disruptive action to what I consider to be an old past-time for many people. I should start by saying that I am a very active movie goer. As I child, it was something we did every Sunday. These days, I still try to go as often as possible. I even used to sneak between movies, although I hear that’s a felony – who knew. The one constant over the years however is the increase in prices. You’ve seen the introduction of things like 3D, IMAX, etc.. and with it, a sharp increase in prices as well. In 2012, we see this entire experience disrupted through fear of violence with the Aurora shooting and other similar events in the preceding months. This however had a marginal impact on the movie-going experience. The release of The Interview however has the potential to be huge. I see it similar to the introduction of things like Netflix, Hulu, and iTunes. When was the last time you stepped into a Blockbuster storefront to rent a movie? The truth is, many probably don’t even remember what these are, and for good reason. These technologies disrupted a huge industry, same applies to the music industry through services like Spotify, Jango and Pandora. 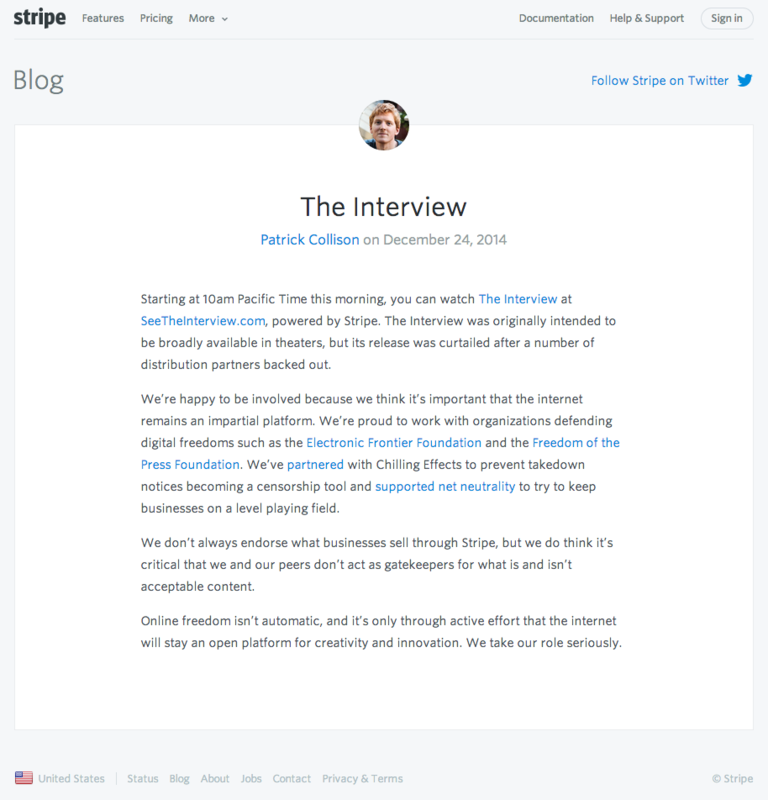 In this instance, Sony partnered with organizations like Stripe and released it via the seetheinterview.com. In this process, they have forgone the traditional consumer experience, at a huge discount. To rent the movie for 48 hours, you paid a measly $5.99. Think about that for a second, instead of paying the $10-$20 a person at a movie theater, you could rent it, stream it to the TV, Phone, Tablet, etc.. and enjoy it with the family, at a fraction of what you have paid originally. The economic benefit for the everyday consumer is huge. Some will obviously argue that there is no replacement for the movie-going experience, and I’d argue, that’s the same thing every one said back in the day of vinyls, tapes, CD’s, etc… I would also argue that there are more people willing to enjoy the reduced costs of a movie-going experience, than those willing to experience it, regardless of cost. Let’s understand for a moment the business of movie theaters. Now, granted I’m no expert here, and I will likely speculate a lot. Think for a moment, why are prices going up? I’d argue it’s likely related to things like increases in movie production costs, the global economic impacts and other similar events. This is only natural, and to be expected. What is the one thing they require to stay in business? They need patrons. Even today, I hear many people talk to not going to the movies because of increased costs. Not only does it cost you $20-$30 for set of tickets, but you’re looking at similar costs for things like drinks, popcorn, candy, etc… The problem has always been, how do you watch / experience a new release? Some will wait, and some will go to the theaters. But I’d argue that the increase in prices is having an adverse affect in the patrons, which further impacts costs, forcing it to increase. In other words, the costs still exist, the volume of patrons is less, and so you offset the costs by increasing costs. The potential pool of people that will pay is shrinking and continues to shrink as costs go up. Many will opt to wait until it comes out on Netflix, how many times have you heard that? While I don’t know the exact numbers, I’d argue that the foot traffic they experience has been shrinking over the years. Something like new movies being released on the web, for a fraction of the cost could be even more catastrophic. Why would a family pay costs in excess of $40-$50 for a couple or more for a family, when they can do it for less than $10 in the comfort of their own home? I sit and watch this as it unfolds fascinated by what will come of this. Will we have a new business model for producers like Sony? One that allows them to forgo the traditional release models? This goes to the fabric of experiencing movies for all consumers.